Cloth Wipes + Cloth Diapers, They just make sense! Why to use Cloth wipes?? Let me show you how easy this can be. 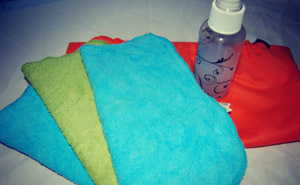 I use a Prince Lionheart wipe warmer to store my cloth wipes, and a wipes concentrate for wipe solution. 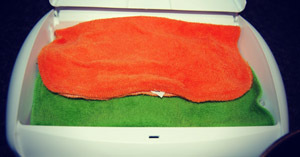 I use two kinds of velvety soft velour wipes which are great sizes and the material is very soft against baby’s bum. How to go about it? I get my solution ready which is 2 tsp for 32oz. making a whole batch I use a spoon to mix the concentrate juice after its all mixed I dunk all my wipes anywhere from 12-16. 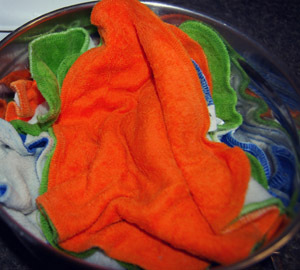 After they are completely soaked I fold some in half and some I just lay them as is and close my wipe warmer and they are now ready to be used. I also use cloth wipes while we are out and about. I normally have some solution left over from the batch I made so I pour it in a small spray bottle, get some dry cloth wipes put them in my wet bag. Now I’m all set to go. When I’m ready to change my son’s diaper I then spray the dry wipe with the solution till its wet enough and wipe the bum. It’s a little more time consuming but that’s what I do for now. I do know that there's a cloth wipe pouch for “on the go” wet cloth wipes. Which I totally would love to get its on my “TO BUY” list. Using cloth wipes is very easy it’s the same as a disposable wipe except its re-usable, soft on babies bum and free of chemicals that can irritate baby’s skin. As far as washing goes I wash our cloth diapers and cloth wipes together I do not rinse our wipes unless it’s one of those “gnarly poops”. It can be very inexpensive you can purchase some wash cloths at your local store for a couple bucks or spend a little more and purchase some that might last a bit longer from your local cloth diaper store or online store or if you’re a crafty mom you can make your own as well. You are also saving a lot of money re-using these cloth wipes instead of throwing your money away. I’m all for saving money! Do you use cloth wipes? If so what are your favorite wipes? If you have not tried cloth wipes I hope that reading this post helps you make the switch. Pollyanna is the mama behind the blog Sew Fatty! She's an awesome cloth diaper advocate and her blog is a valuable resource.She's also a Navy wife and mama to two beautiful munchkins. Polly loves to sew, clean, cloth diaper, watch movies and spend time with her family. I used cloth wipes religiously for nine months but once my daughter started solids i found it difficult and have disposable wipes for messy diapers. I made my own cloth wipes from an old beach towel and an old flannel sheet. They were FREE then and work so great that i made a set to replace the need for paper towel in my kitchen. @Mama Bear they can definitely be very inexpensive thats awesome that you found some materials to make them with. So awesome to hear different stories.